Let’s get one thing straight: there is nothing that you have to do or serve to make Thanksgiving successful. You may think you’re forced to have cranberry sauce and pumpkin pie, but remember that you’re always free to break away from tradition if you so choose. Thanksgiving is after all one big fun dinner party where you take time to think about all the things you’re grateful for. Who said you needed a specific menu to do that? In fact, if there was a holiday that represented Foodie Underground, Thanksgiving would probably be it; the ethos of this beloved holiday is right in line with our own motto “good food, from good places, with good people.” Sometimes, that might even mean sweet potatoes doused in mini marshmallows, but beyond what you serve, Thanksgiving is about taking time to be with friends and family. In other words, celebrating. I had never cooked a turkey until last year. With a family of three, we have normally gone the route of buying an already roasted one, or simply eat something else. But last year my mother and I decided we would make a grand effort and cook a big bird, just to say that we did. It wouldn’t kill us to at least have one traditional Thanksgiving dinner under our belts. My mother kindly positioned the bird, we did the roasting rigamarole, basted it every 45 minutes and come dinner time we had the iconic Thanksgiving dish. But the Brones kitchen has always been devoted to simple foods that seem complicated, not the other way around. And don’t let anyone fool you, for the amount of work, at the end of the day, turkey is kind of a boring meat. So a few rounds of basting in and The Turkey had quickly turned to The F*cking Turkey (TFT for short). 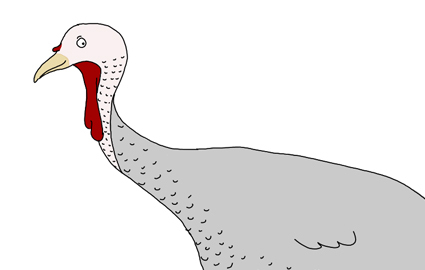 “I hope you’re not expecting turkey this year,” my mother said on the phone a few weeks ago. “TFT?? Never again!” I exclaimed. We decided on lamb instead, because again, my kitchen skills lack, and it’s high time I learned how to prepare a lamb roast. And more importantly, in our house, lamb would never ever deserve an expletive. Locally raised of course, although I have forgotten to ask my mother what its name was. I am sure she knows. I promised to take care of the rest of the meal and Thanksgiving was officially taken care of. 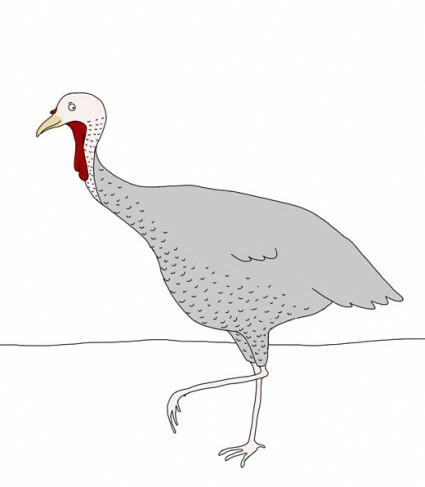 Less time being freaked out by a slimy bird carcass that may or may not come to life and squawk around the kitchen and more time eating two minute cranberry salsa. That’s my kind of celebration. Sans TFT. 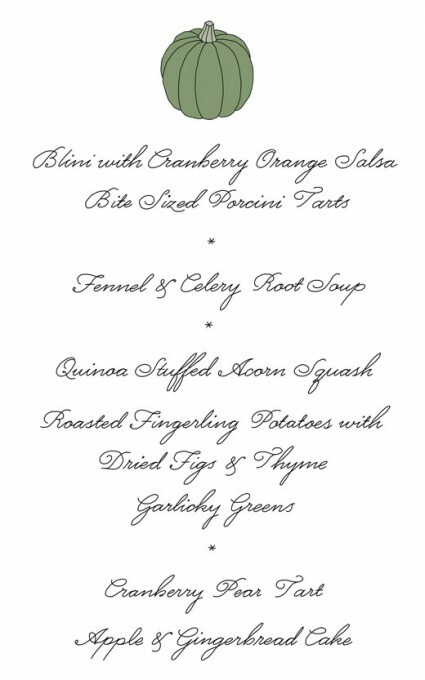 So in the spirit of Thanksgivings that may or may not involve birds, here’s a completely planned menu, from appetizer to dessert, to fit all dietary restrictions, illustrated by the lovely Johanna Kindvall. It’s all vegetarian, partly vegan, mostly gluten free, and if you’re good about it, can incorporate quite a few local and seasonal products. The recipes are from a handful of our favorite food blogs, so to access them, just click on the links.